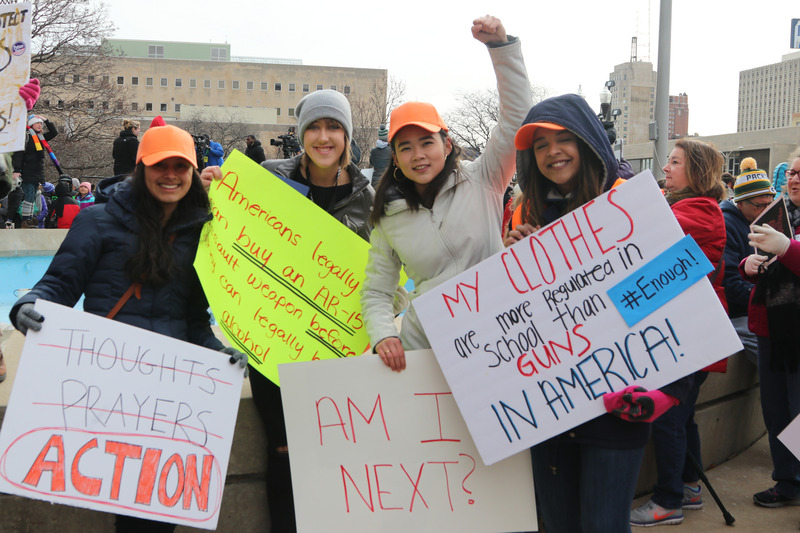 Hundreds of participants in the recent March for Our Lives in Milwaukee are looking toward November to elect representatives willing to stand up to the NRA and pass legislation to limit availability of guns. “Our voices collectively are powerful and loud; and I expect nothing less than absolute change,” Destiny Devooght told the crowd outside the Milwaukee County Courthouse, 901 N. 9th St.
Devooght, a senior at Union Grove High School, said she expected that about 10 people would show up at a walkout she organized on March 14 in response to the fatal Parkland, Florida school shooting in February. Union Grove ended up with 170 students participating. Devooght then applied to be a student speaker at the March for Our Lives in Milwaukee on March 24. 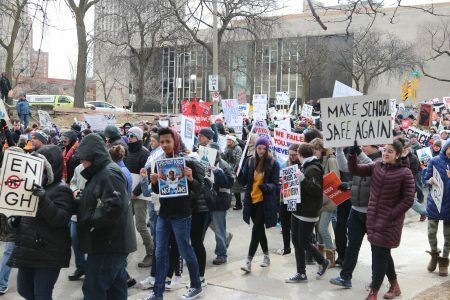 Milwaukee’s march was one of more than 800 that took place across the country. The nationwide movement was started by survivors of the Florida school shooting in which 17 people were killed, including 14 students. People of all ages and backgrounds showed up to take a stand at the event, which included music, nondenominational prayer and speakers calling for stricter gun laws. Photos were shared on social media using the hashtag, #WeCallBSMKE. Arianna Neal, a 17-year-old student at Germantown High School, 11501 N. River Lane, said she was there because kids should never feel afraid to go to school and parents should never fear for their child’s safety at school. “Kids our age have been deemed as uneducated about government and uneducated about how the system works, when actually, we take classes about this stuff, we educate ourselves and we involve ourselves in politics,” Neal said. The marchers left the Milwaukee County Courthouse and walked east on State Street toward City Hall, 200 E. Wells St., chanting in opposition to gun violence. Voter registration booths were set up at City Hall. For many students, it would be the first time they registered to vote. “I am so glad that our generation is not going to stop, even when politicians say we are,” said Jackie. Eder invited young people to participate in the “50 Miles More” four-day march, which took place immediately after the March for Our Lives. Young people from all over Wisconsin gathered in Madison and marched 50 miles to Janesville, the hometown of U.S. House Speaker Paul Ryan. “We are directly calling out Paul Ryan for his direct role in blocking and banning any chance of gun reform,” said Eder. Many signs criticized the National Rifle Association and called for “common sense” gun laws that expand background checks for online sales and at gun shows. In 1963 Percy James marched on Washington during the Civil Rights Movement. Fifty-five years later, he participated in the March for Our Lives, holding a painting of his late wife, who was active in the anti-war movement. “I didn’t realize until after she was deceased that she was a wonderful mentor to me and this is the very least I can do to memorialize her,” said James. Members of Moms Demand Action For Gun Sense in America, an organization created in 2013 by moms in response to the deadly Sandy Hook Elementary School shooting, also participated in the march. The group has 4.5 members and a chapter in every state, including 75,000 members in Wisconsin. Chris Krasovich, the Wisconsin chapter lead of Moms Demand Action, has been involved with the organization for more than two years. “We know that children are dying and paying the blood price for our failure to enact common sense gun legislation and we’ve had enough,” Krasovich said at the march.